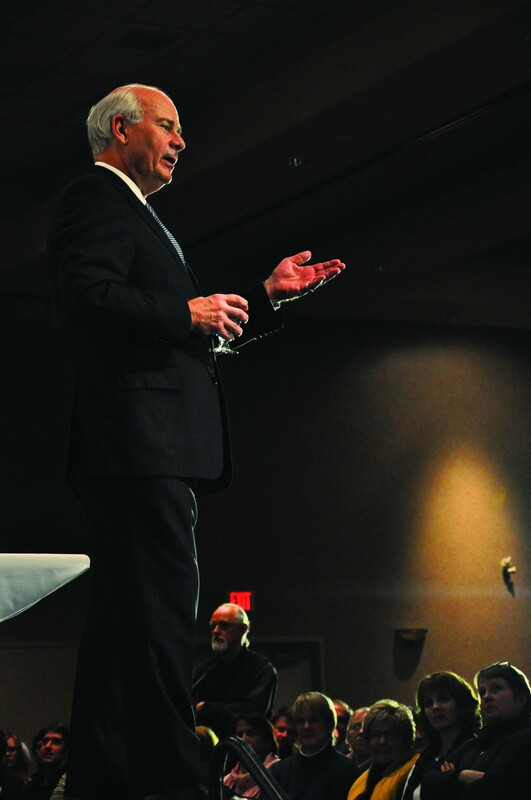 Peter Mansbridge, possibly the most recognizable and well-respected newsman in Canada, entertained and enlightened an audience of hundreds in the Grand Hall of the Campus Activity Centre on Jan. 19. He made us laugh; he made me cry (if getting emotional about Canadian pride is wrong, I don’t want to be right), and it was a great night by all accounts. Part of the TRUSU Common Voices Lecture Series, Mansbridge opened by commenting on the weather and how it was “nice to see Kamloops knows how to celebrate winter,” (it was during a cold snap) and went on to talk a bit about the aspect of celebrity associated with his chosen career and his place in Canadian culture. “It’s easy sometimes to get carried away in assuming that means that everybody knows who we are,” he said, “and every now and then it’s good for us to be reminded that not everybody watches television, and not everyone watches the news,” he said, humbly admitting that he has made the mistake of a slight lack of humility himself at times. And that’s when he realized that he shouldn’t assume that people know who you are just because you’re on television — and yes, he still got that speeding ticket. A 19-year-old Mansbridge was working for Transair, a small regional airline on the Prairies, mainly servicing the Canadian North. He did a bit of everything — loading cargo, selling tickets and fuelling planes — when he was asked one day to announce the flight to Winnipeg over the public address system. After he’d announced the flight, “people were all moving towards the gate, but this one chap came straight towards me,” he said. He told stories of various interviews he’s done with various famous figures — not the least of which was US President Barack Obama — but once the autobiography section of the night was done, and the audience’s collective stomach muscles were exhausted from laughter, Mansbridge told three more stories. He told the story of being in Sri Lanka after the devastating tsunami in late 2005 and meeting a small child who recognized his Canadian flag pin on his jacket, and in broken English said, “Canada good,” and he wondered how she could possibly know about Canada, let alone have that attitude about it. He told the story of being in the Netherlands and seeing a parade for WWII veterans on May 8, 2006. And he asked a woman who was holding a small child why she would bring her son out in the pouring rain to watch as the uniformed old men marched past. “For almost all of my reporting career, I’ve been trying to answer that question,” Mansbridge said that night in the Grand Hall. The third story was about a graduate from McGill University that he’d met in Afghanistan, whose job it was to explain to Afghan women what their rights were under the new constitution. What was more amazing than the job she was doing was the fact that she’d been born in Afghanistan, and her family had fled that country and were welcomed by Canada as refugees in the early 1990’s. “What’s the thread through those three stories?” he asked the crowd. “I’ll tell you what it is for me. “For me the thread is that we care. We care not only about ourselves and our families, but we care about our neighbours — whether those neighbours are across the street, across the city, across the province, across the country or on the other side of the world. That’s what a Canadian is according to Peter Mansbridge. And everyone who was in that room on Jan. 19 felt it to their very soul, I think. I for one will certainly never ask the question again.